Several years ago, when I was doing 1940s costume research for Captain America: The First Avenger (2011), I happened across the NC State University 4-H collection. This archive is a wonderful resource for images of rural American life, particularly from the 1920s-1960s. I found a handful of photos of my grandparents in the collection, including a photo of 4-H Honor Club at a 1936 Short Course that features both of them; a couple of my 16-year-old grandfather in Washington, DC, for the 1929 National 4-H Convention; and a photo of my grandmother that appeared in the paper after she was named 1934 Health Queen for the state of North Carolina. 4-H is a global youth development organization, which is run in the US by the Department of Agriculture’s National Institute of Food and Agriculture. Historically, 4-H clubs were predominately located in rural communities and had an agricultural focus. My paternal grandparents were extremely active in North Carolina 4-H throughout their lives. They actually met during a 4-H Short Course in 1936; the top photo was taken the week, if not the day, they met. I’ve been out of town for a few days visiting my parents in North Carolina. I just sifted through a box of paper artifacts from my grandparents’ house that included report cards, school papers, newspaper clippings, photos, and other ephemera. The bulk of it, though, related to their time in 4-H, including a photo of my grandfather and 1929 national 4-H delegates with President Hoover on the White House lawn. 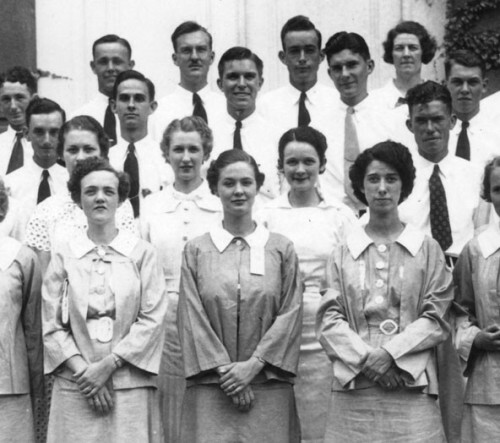 1929 National 4-H Convention delegates at the White House with Herbert Hoover. Among the more interesting items I found at my parents’ house was my grandmother’s 4-H scrapbook from the mid-1930s. It offers a glimpse into the life of a teenage girl in the rural South during the depression. It contains newspaper clippings about her 4-H involvement, a judge’s scorecard from a 4-H Health competition, and a questionnaire about her eating habits. There is an entire section on canning, detailing how much of each type of fruit or vegetable she canned each year. According to one of the newspaper clippings she saved, by the age of 14 my grandmother sewed all of her own clothes. Her scrapbook contains swatches of each of the outfits she made, as well as the occasional picture of the pattern she used. She included pamphlets and articles about fit and fabric that she found helpful. My favorite is a pamphlet about making clothing from Dixie Crystals bags. The Great Depression was an economic leveler that gave rise to an agricultural era in America. Consequently the photos and materials in 4-H archives and personal collections, such as these, are great references for what life was like for many Americans in the 1930s.